Sandy Cape Lighthouse | Lighthouses of Australia Inc.
Due to a financial crash, Sandy Cape missed out on the honour of being the new Queensland Government’s first light to Bustard Head. The Queensland Engineer for Harbours and Rivers, Joseph Brady did a tour of inspection of the northern ports in 1865 and strongly recommended that a light be place on Sandy Cape. The area off Sandy Cape, known as the Breaksea Spit, has seen the loss of over 20 vessels. Even Cook’s Endeavour nearly floundered here. Even though parts to make the lighthouse were ordered and received by 1867 due to the 1866 financial crash in Queensland the tower was not assembled and exhibited until May 1870. Building the lighthouse was achieved by the Rooney Brothers who won the contract. They bought a 200 ton vessel The Resolute to bring the tower and lantern room from Brisbane, and the cement from Sydney. Materials were brought by to the shore by ship, then unloaded into workboats (barges), then to trolleys and hauled by horse, on a specially constructed two stage trolley way laid with wooden rails, to the site, 100 m above sea-level. The first stage rose 50 metres over a 1.2 km section, and the final 50 metre lift to the site was by a horse operated windlass, with the trolleys pulled up the 60 degree sandy slope. The trolley way was maintained up until approx 1927. It had originally been intended that the light would be finished before the Bustard Head light and therefore be the first constructed by the newly independent Queensland government, but this honour fell to Bustard Head in 1868. 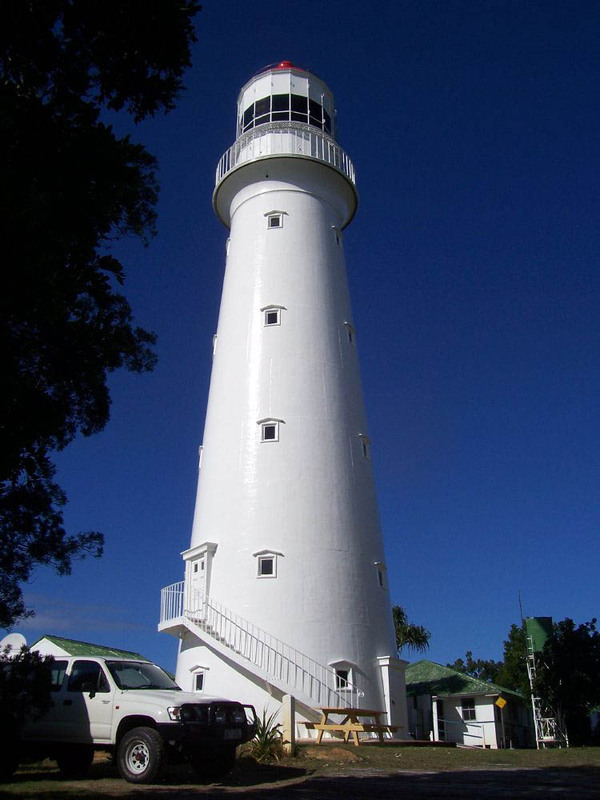 The first Queensland light was Cape Moreton, but was built 2 years before separation in 1857. The tower is similar to the one already constructed at Troubridge Shoal, South Australia, being assembled from cast iron segments manufactured by the Hennett Spinks and Company of Bridgewater, in Somerset, in England. Sandy Cape’s doorway has “Kitson & Co LEEDS 1866” cast above it. As with many lighthouses of the period it had a Chance Brothers apparatus. It has 5 floors connected by an internal staircase. Sandy Cape’s first apparatus was a revolving first order lens that flashed every two minutes and had a range of 20 miles so as to extend over the Breaksea Spit. The cottages were built of weather board and iron roofs to house the Head Keeper, and 3 Assistant Keepers and their families. Captain George Poynter Heath, the first Portmaster of Queensland, stated that the greatest danger on the Queensland coast, the Breaksea Spit was now safe. The original light source was an Argand oil lamp containing a number of concentric wicks initially fuelled by Colza or Rapeseed oil and then by Kerosene from about 1875. As with many remote major Queensland lights a school mistress was supplied and would have been billeted with one of the families. Sandy Cape had a much loved and famous school teacher – Selina Lovell, who was the longest-serving (16 years?) around the 1880’s, and who described and named a few plants, and described a couple of sea monsters – one fits a Manta Ray, the other a Plesiosaur. Early in the 20th Century the light source was converted to an incandescent mantle using vaporised kerosene from a Kitson burner. Like other lights of the period the light was rotated by a clockwork mechanism that had to be wound up by the keepers art regular intervals. The lightstation, being a coastal light, was transferred to the Commonwealth in 1915. The light was converted to solar in 1995. The two quarters and workshop have been powered by solar and wind RAPS (Remote Area Power Supply) since 2001, with storage in a battery bank and backup by diesel generator. Installation and manufacturers problems with the wind turbine has seen the station using only solar and diesel since October 2002. New keepers’ cottages were built around 1933. It is interesting to note the things we take for granted such as septic tanks were installed in the 1960s and from what I have seen the kitchens being modernised in the 1980s is an understatement! Access from the beach to the tower was improved with a boarded roadway in 1970s. The important of this is two fold. One, less problems with bogging of vehicles in the sand. Secondly protecting the access road from heavy scouring after rain. According to former keeper and current ranger, Aubrey Strydom, they got a “Flash new brick engine room in 1974”. During World War II the station was also RAAF No. 25 Radar Station. 30 men were based her in huts in the valley. The bunkers still remain today as visitor attraction. During this period the keepers and their families still remained at the station. After 82 years under Commonwealth control the lightstation reserve was transferred back to the Queensland Government in 1997, for the peppercorn price of $1, and is now Administered by the Queensland Parks and Wildlife Service.